Summer chess camp can help prevent summer learning loss and prepare your child for the coming academic year. National Scholastic Chess Foundation, an education non-profit dedicated to improving education and inspiring excellence through chess, operates summer day chess camps in Hartsdale and Manhattan. NSCF instructor Tharin Chadwick works individually and with small groups of students during summer chess camp in Hartsdale. Academic summer camps are a great way to keep your child exercising both mind and body over the long summer break says the National Scholastic Chess Foundation. NSCF: National Scholastic Chess Foundation operates six weeks of summer chess camps held at Solomon Schechter Upper School in Hartsdale, NY that combine fun with intense learning on a single subject. In addition the Foundation provides 4 weeks of chess camps at Speyer Legacy Academy in Manhattan. “Students are increasing their knowledge and confidence in chess so they come back ready to progress with the next year’s material. Typically we spend the first few weeks of every school year covering material from the previous school year that has either been forgotten or just fallen out of practice,” says Mr. Weeramantry. This does not only apply to chess. A 2013 Johns Hopkins University survey found that 66 percent of teachers have to spend three to four weeks re-teaching students course material at the beginning of the year, while 24 percent of teachers spend at least five to six weeks re-teaching material from the previous school year. The National Summer Learning Association reports most students lose about two months of grade level equivalency in mathematical computation skills over the summer months. Low-income students also lose more than two months in reading achievement. NSCF chess camps are for K-12 students with most participants coming from elementary and middle school grades. The camps feature both group and individual instruction and balance formal chess instruction with friendly competition. Every day also includes outdoor activities such as soccer and basketball and a daily hot lunch is also included in the full-time camp fee. The NSCF staff is comprised of full-time chess professionals who all share an enthusiasm for working with children. Every teacher is an active tournament player as well as provider of classroom instruction. Whether your child wishes to learn new strategies or improve existing skills, the end result will be a stronger player who has mastered new skills for the chess board and for life. 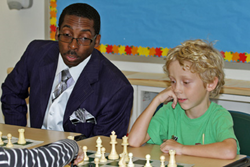 About NSCF: Dedicated to improving education and inspiring excellence through chess, the National Scholastic Chess Foundation specializes in curricular chess instruction and offers strategic development support for schools and other partners. With headquarters in White Plains, NY, NSCF offers chess instruction within the curriculum as well as in after school in over 70 schools in 30 different communities in New York and Connecticut. NSCF’s founder and executive director is FIDE Master Sunil Weeramantry, a nationally acclaimed instructor who has over 40 years experience teaching, coaching and developing award-winning programs.